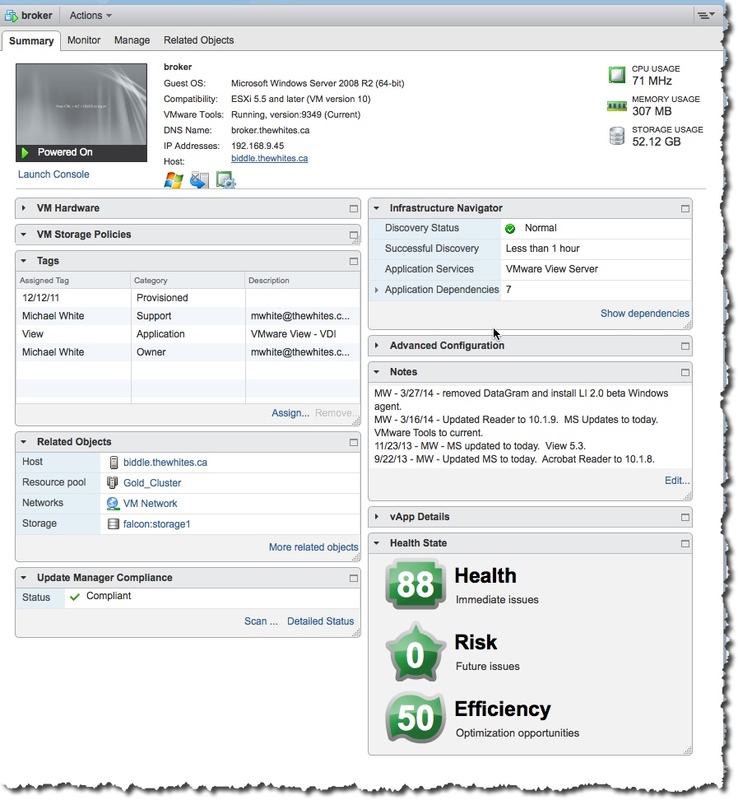 Are you using vSphere tags? I was talking about using vSphere Web Client tags today with someone and I realized I should show others the same thing. I find them very handy. First I will show you what they look like. What you see above is my View server. Notice the tags? You can see that I both own, and support View in my lab. It was provisioned in 2011, and that the application is in fact View. I created and applied those tags myself. You can also search for them. You type in a tag name in the search window in top right of your screen – in my case I type view as seen below (remember you can click to see a bigger version of this shot). Now you can see the results of that search – my two View servers. This is a very simple example of how handy tags are. In my case you can search on owner, support, provisioned, or application. So very handy indeed. BTW, in the first screen shot above, notice the Health State and Infrastructure Navigator widgets? Both very handy and thanks to vC Ops and VMware Infrastructure Navigator being installed. Nice to see for each host or VM the health, and what it is being used for. If you have a lot of virtual machines / hosts, and or a lot of tags you might want to use, my friend Alan has a way for you to do it much easier – through scripting. Check it out here. So if you don’t use vSphere tags, you should think about it. I think you will find them quite useful and I think you may see them used by vendors like VMware and others in the future. Next Post vExpert 2014 – wow!